"Now you're about to see something really special." Sometimes I make this declaration to anyone sharing the table with me right before I dive into an obscenely overloaded plate of barbecue. It's not that I mean disrespect to what's on my plate by wolfing it down. Rather, I'm describing the exquisite pleasure I'm about to derive from that plate. On some occasions, my ecstasy borders on the pornographic but, if you get too close, you could lose a limb. Yesterday, I uttered these words while standing in line at Louie Mueller BBQ in Taylor, Texas, well before my plate was even prepared. 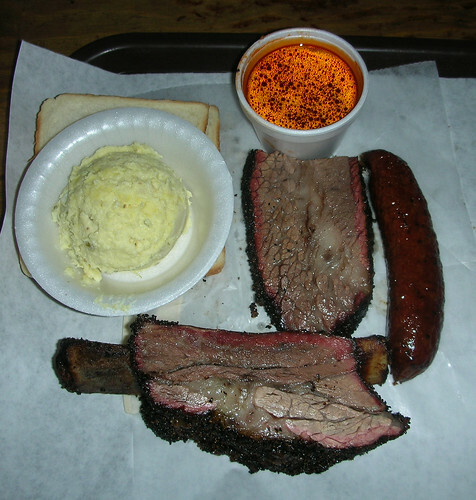 One of the true Texas barbecue shrines, Louie's was founded in 1946 as a grocery, Louie Mueller's Complete Food Store. After opening a barbecue shed to feed workers from a nearby railroad yard and from area cotton fields, Louie Mueller's opened in its present location at 206 W. 2nd Street in 1959 in what had been a ladies' basketball court in 1923. The walls and ceiling of the cavernous, dimly lit temple are darkened by years of oak smoke that emanates from the brick oven in the center of the building. There's a corkboard full of business cards that, having never been removed, range from tanned to blackened from the years of smoke. Added in 1999, the screened-in dining area brings some air circulation to the proceedings. So, indeed, at Louie's, "atmosphere" isn't some frou-frou, ephemeral term with which to describe the indescribable. 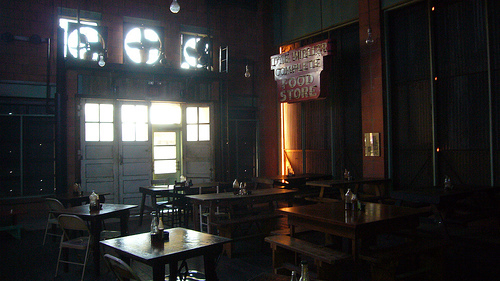 At Louie's, like Kreuz's Market in Lockhart, you literally breathe it. Naturally, there's history to along with that atmosphere. Louie's son, Bobby, bought the place out in 1974 and began serving cole slaw and potato salad, which were his mother-in-law's recipes. Bobby has made the hot sausage from scratch since the '60s. Bobby's son, Johnny, brought a taste of Taylor to Austin at the now-closed Johnny Mueller's on Manor Road. From what I've been able to gather, there's been years of bad blood between father and son. While I can't confirm the nature of the dispute, the bottom line has been that loyalty to Bobby versus the convenience of Johnny being in Austin has been a conundrum for barbecue aficionados in Austin. It was bittersweet to discover upon our return to Austin that the issue was rendered moot last year when Johnny's sadly closed. But back to Louie's. Right out of the gate, I've got a lot of use for a barbecue joint that pours draught Shiner Bock in chilled Mason jars. When I was growing up in Columbus, Ga., on Sundays after church I drank gallons of IBC root beer that Country's Barbecue served in Mason jars. Nostalgia goes well with barbecue. It should come as no surprise that Louie's serves its meat on butcher paper in the old-school Texas tradition. As was with the case with Johnny, Bobby makes a point of cutting off a piece of brisket for you to sample while he gets your meal ready. As was not the case with Johnny, Bobby spares you the splash of surliness often dished out to unwitting customers on Manor Road. The clear musts on the menu are the moist brisket and the jalapeno sausage. They've introduced chipotle sausage as well, but I saved that for a return trip. The brisket comes in slices nearly three-quarters of inch thick, featured nearly centimeter-thick smoke rings and, as was the case with Johnny's, practically melted in my mouth, such was the slow-cooked consistency. Similarly, the tender, fine-ground sausage fell apart as soon as I cut into it. Like the brisket, the sausage was well-marbled and thus drenched in moist, fatty goodness. Per personal custom, I skipped the white bread, which might've been a misstep this time. Owing to the cayenne and jalapeno, Louie's sausage has a long-lasting piquancy that can overshadow your appreciation of the other items on your plate. A splash of iced tea or beer can put some of the fire out, but a little white bread might make a more effective sorbet with which to cleanse the palate. I'm just offering this as a caveat to the taster, not as a criticism of the meat, which, as Gourmet and the James Beard Foundation and others have noted, is exceptional. I also tried the pork ribs, which, like the brisket, feature Louie's signature rub, a delicious cracked pepper blend that accents the flavor of the meat without overpowering it and seems to hold in the moisture as well. This may be my regional bias rearing its head again, but it seems an unfortunate fact of life with Texas barbecue that, when you order pork ribs, you can expect spare ribs, rather than the loin back ribs, which are prized in Memphis for their fall-off-the-bone tenderness. Spare ribs have more meat per rib, but, in spite of being a fattier cut, lack loin back ribs' tenderness. Additionally, there's a bit more effort required to get all of the meat off. Still, Louie's does a fine job here and the smoky oak flavor, combined with the delicious rub, does plenty to balance any criticisms of texture. It should be noted that Taylor is also home to the Taylor Café, another historic barbecue establishment, which I'll have to cover in a later dispatch. By the way, Happy Father's Day. If you live in the same town as your dad, take the ol' man out for some 'cue.